Expert DIY advice on how to repair stucco siding, including tips on patching holes in stucco, and fixing cracks and stains. Stucco is a very strong, durable cement-like siding material but repairs are sometimes needed for cracks and holes. Though you’re better off leaving major stucco repairs to a mason or stucco specialist, you should be able to handle fixing most holes and cracks if you have do-it-yourself experience. The way you make these repairs will depend upon the nature of the damage, such as the size of the hole. Here we look at typical stucco repairs. For information on painting stucco, please see How to Paint Stucco. Patching large holes in stucco is a job that homeowners adept at basic home repairs can handle-though it may be difficult to create a patch that blends perfectly with the wall unless you repaint. If you are not comfortable doing this type of repair, contact a local siding contractor. 1Remove loose stucco from the hole with a cold chisel and ballpeen hammer as shown at right; blow out the dust. Staple new wire mesh over any damaged mesh. Spray with water. 2Apply the first coat of stucco to within 1/4 inch of the surface, using a mason’s trowel or putty knife (stucco should ooze from behind the mesh). When firm, scratch with a nail. Let cure for two days. 3Apply the second coat over the dampened first coat to within 1/8 inch of the surface, using a mason’s trowel or putty knife, as shown below left. Smooth the stucco and let it cure for two days. 4Apply the final coat over the dampened second coat with a metal float or mason’s trowel. Smooth flush with the existing surface. Texture as desired, and allow to cure for four days. HomeTips Pro Tip: For deep holes, build up the patch with several successive layers, allowing each to dry before applying the next. Match the texture by touching it up with a float or a small brush. 1Use a stiff brush to clean out the hole. If the hole is too small for a brush, use an awl or nailset to scrape out any loose material. Then blow out the dust (wear eye protection). 2Apply a new patch of stucco patching compound, using a putty knife. Pack it tightly into the hole and fill almost to the surface. Allow this patch to set up until it is stiff. 3Apply a top coat of patching compound. Use the putty knife to blend the surface of the patch so that it matches the wall. Then allow this coat to dry. Cracks in stucco are a common problem. Stucco, after all, is not very resilient–it’s made of cement. So when a house settles over time or shifts because of heavy winds or earthquakes, the stucco siding cracks. The proper way to repair these problems depends upon their size. Very fine, hairline cracks are very easy to fix. If they are super-thin, a coating of acrylic latex paint that matches the siding will probably do the job. If they are a little too wide for paint to fill the crevices, fill them with latex caulking compound first. Allow this to dry thoroughly, then paint the surface with acrylic latex paint. For wider cracks, apply an all-purpose filler such as pre-mixed bridging and patching compound that is intended for stucco repair. When apply this, follow the label directions. Though stucco is a very tough surface, it can look weathered and dirty over time. 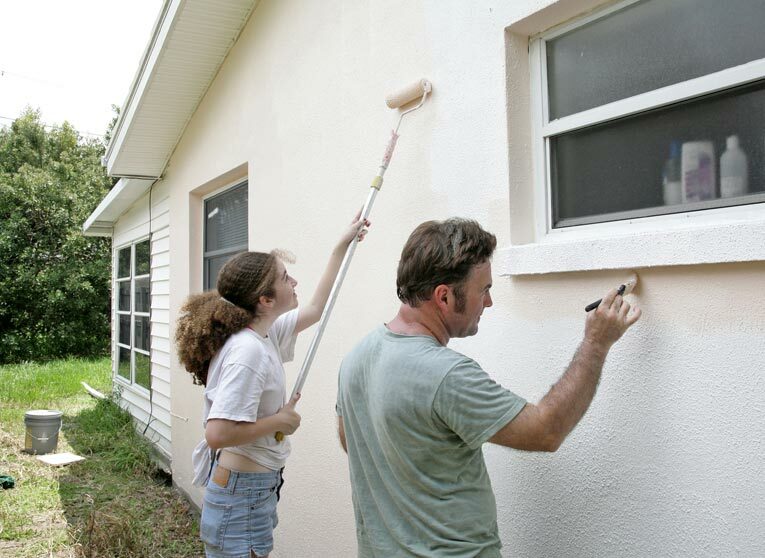 Unlike other siding materials, you shouldn’t use ordinary house paint to paint stucco because the walls need to “breathe.” Otherwise, interior moisture can get behind the paint and cause it to blister or peel. Instead, have the wall “re-dashed” by a stucco contractor. If your stucco is white, a simpler (though more temporary) solution is to have it whitewashed with a mixture of water and white Portland cement. It’s best to have this done by a professional painter or stucco contractor.